The story of Mister Robert is about quality furnishings, unique designs, and impeccable customer service. These characteristics perfectly sum up our co-founder Sara Jean Calonkey. Her story starts at the University of Oklahoma shortly after WWII when she met Robert “Bob” Calonkey. From the very first day, the couple was inseparable eventually marrying in 1950 and forming a relationship that would last more than 66 years. Sara Jean already knew a lot about Norman and the furniture business. Her family came from Ireland to Oklahoma in 1890 and had been in Norman ever since. Her father, Robert, started Landsaw furniture in 1931 and Sara Jean grew up in the business. At a time when few women went to college, Sara Jean graduated from the University of Oklahoma and then went to work in the family business. 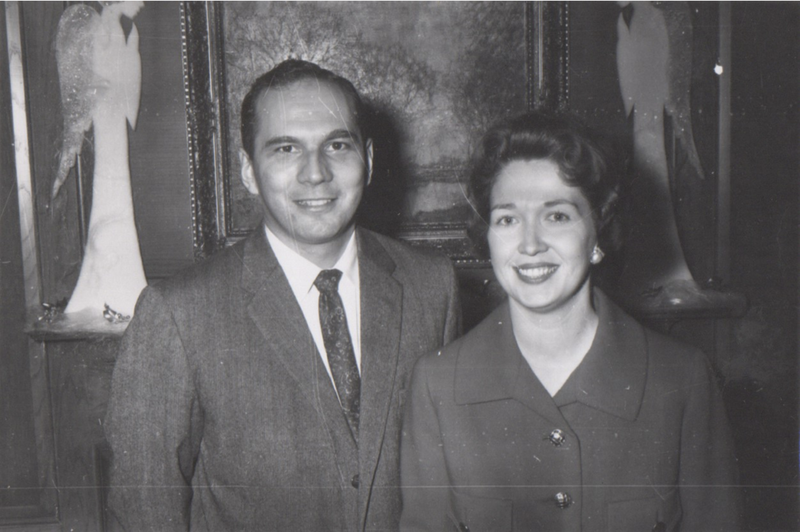 She and Bob worked at Landaw furniture for a number of years before leaving that business and starting Mister Robert in 1958. Sara Jean always said Bob had the “head for business.” He on the other hand always said that it was Sara Jean’s sense of style that gave Mister Robert its unique flair. She insisted that Mister Robert carry accessories, something that was not typical for furniture stores of that time period. She also innovated the display of product, making Mister Robert one of the first stores in the area to set up the furniture in room settings. She did this to allow customers to visualize how the furnishings could look in their homes. She also offered complimentary in-home design consultation, a service that we still offer today. She worked six days a week for years helping customers create unique living spaces. Perhaps her greatest enduring legacy are our display windows, still beautifully appointed on Main Street. To this day our windows are a shopper’s dream. It was Sara Jean who insisted that they should be changed regularly to give customers to chance to see what is current, and how their homes could be transformed. Bob (Mister Robert) always gave Sara Jean the credit for the style and passion of the store and worked with her side by side for more than 50 years. Sara Jean was a woman before her time. She was a working wife and mother who made a career out of beautifying the spaces in which people lived. A woman of faith and impeccable style she helped form the foundation that is Mister Robert Fine Furniture & Design. She and Bob’s love and legacy continue at Mister Robert to this day as we strive to make every space, a living space.